For our U.S. guests, the first and probably most economical would be to arrange a flight via Minneapolis into International Falls, MN. From there, the picturesque drive to Anderson’s Lodge is only 3 ½ hours. 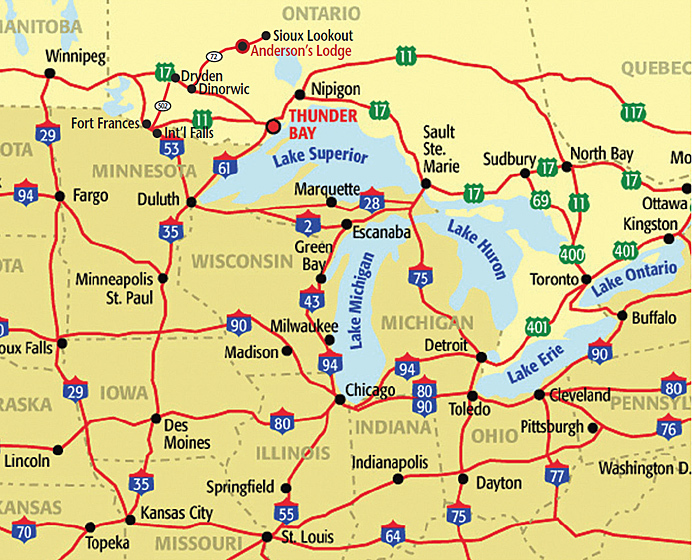 We will assist you with your car rental reservation, and send you the necessary map with directions to the lodge… it’s so easy! For our Canadian guests, options could include flights from Toronto into Thunder Bay, Ontario, or Winnipeg, Manitoba. From either of these destinations, Carlson Wagon Lit Travel Sioux Lookout can assist you in booking connecting flights with Bearskin Airlines directly into Sioux Lookout where we can pick your party up at no fee. Anderson’s Lodge is about a 20 minute drive from the Sioux Lookout Airport. Flight schedules and pricing can be obtained by calling Carlson Wagon Lit Travel Sioux Lookout at 807-737-3600 or emailing victoria@enjoytravel.ca. Driving time from Thunder Bay to the Lodge is @ 4 hours and from Winnipeg is @ 5 hours. Charter & Personal Flights: For those who wish to charter or fly their own aircraft, the Sioux Lookout airport features a 5000 ft. airstrip. We will provide shuttle service to and from the airport for your group, as well as to and from any of the many different landings that you may choose to fish from on a daily basis. 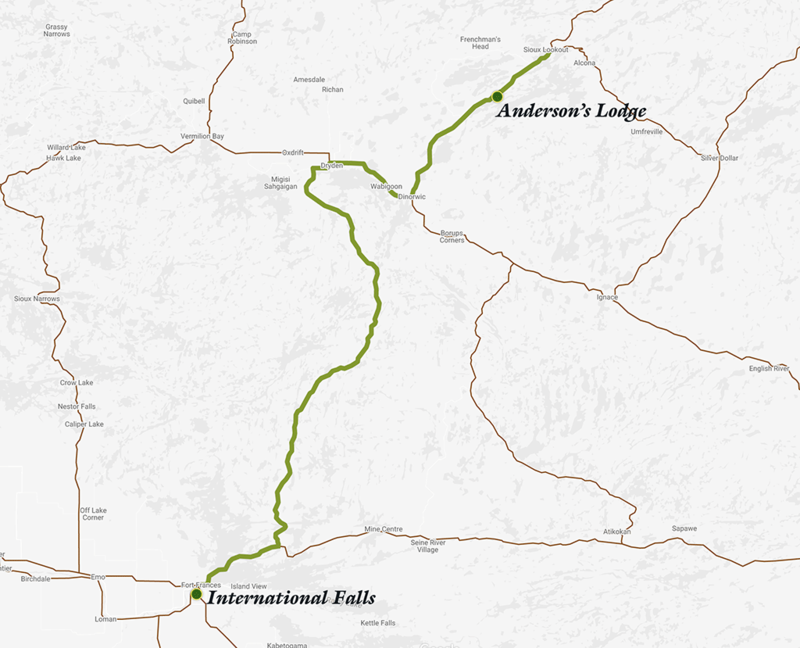 If you plan on driving to Anderson’s Lodge, the map below illustrates major routes and travel distances so that you can determine how much time is needed to get to us and which routes are the quickest. If you require overnight accommodations during your trip, we can assist you by recommending establishments within 1 to 5 hours from our lodge. 2385 Highway 72, Sioux Lookout, Ontario. Once you reach International Falls, cross the border to Fort Frances, Ontario. Take Highway 11 East until you get to Highway 502 North, and take that route. When you meet Highway 594, take the East route. Go through Dryden, Ontario until you reach Highway 17 East again. At Dinorwic, Ontario take a left turn onto Highway 72 North to Sioux Lookout. We are located on the right hand side of that highway approximately 9 miles before the town of Sioux Lookout. This trip is about 3 ½ hours in length. 2010-2016 Anderson’s Lodge. All rights reserved.